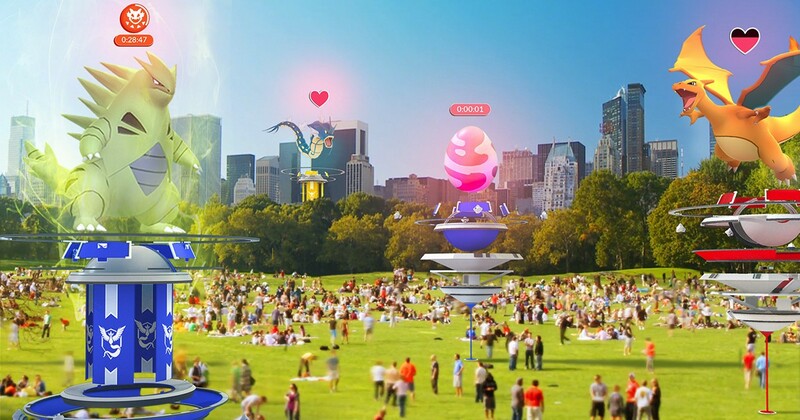 Pokemon Go Update With New Gym And Raid Battle Features Announced. Just about a year ago, Pokémon Go came out of nowhere and took over the world. If you lived in any sort of big city, you probably couldn’t go a block without seeing a Go player sprint by, staring at their phone all the while. The hype inevitably died down, of course. Some people caught everything there was to catch; others stopped as the summer nights turned chilly; others simply got bored and moved on. The game still has a sizable player base — about 65M people, as of April of this year — but for the most part, gone are the overwhelming crowds of people running through the street because someone spotted a Snorlax. The game’s second summer is just around the corner — and with that in mind, it’s about to get one of its biggest updates yet. First things first — Pokémon Go Gyms will now also have PokeStop discs on them, meaning every five minutes you can spin them for more items to use in the game. This is especially good news for rural areas, where Pokémon Go content is more spread out and less easy to walk to. The days of stacking five Blissey on a Gym to ensure your team maintains control are over. Niantic has removed that system from the game entirely, and a new system will take its place shortly. In this new system, only one version of any Pokémon can live at a Gym simultaneously. If you put a Tyranitar on a Gym, no one else will be able to as long as it is there. Gym battles are changing as well. Instead of fighting Pokémon from lowest CP to highest, you'll be fighting in the order they were placed at the Gym. In theory, this means you might fight the strongest Pokémon placed at a Gym first, which would make taking down a Gym by yourself a bit more challenging. Every time you defeat any one Pokémon, however, that creature loses something called Motivation. As Motivation decreases, the CP of that Pokémon temporarily decreases as well. Trainers can keep Pokémon motivated by feeding berries, which means trainers can interact with a Gym remotely instead of needing to be right there. When Motivation is completely lost, that Pokémon returns to its trainer. Finally, and perhaps most important, Gyms will now give you badges for continued participation. These badges can be leveled up based on your continued participation, and the badges will offer rewards based on the current level. The whole reason Niantic is retooling Gyms is to prepare for Raids. If you watched the initial launch trailer for Pokémon Go, you saw a section where multiple Pokémon Trainers were working together to fight a Mewtwo. That obviously doesn't exist in the game right now, and Raids are how this is being addressed. Here's what we know so far! Raid Bosses clear a Gym: When a Raid Boss shows up, all of the Pokémon at that Gym will be sent back to Trainers. After the Raid Boss leaves, the fight to control that Gym restarts anew. You need a Raid Pass: If you want to participate in a Raid, you need a Raid Pass. The PokeStop at the Gym will give you one for free each day, but you can only hold one Raid Pass at a time. The Shop will have Premium Raid Passes, which will let you battle at any Raid. Raids support up to 20 trainers: It doesn't matter what team you are on, you will all be able to work together to take down a Raid Boss. Victory means unique rewards: If you successfully take down a Raid Boss, unique rewards like exclusive candies and berries will be available to your whole Raid team. You can catch a Raid Boss: If your Raid Team successfully defeats the boss within the five-minute limit, you'll have a one-time chance to catch a less powerful variant of this unique Pokémon. This is undoubtedly how Niantic will introduce Legendary and Shiny Pokémon into the game. Catching a Legendary Pokémon will be pretty sweet, but the other rewards promised will make your day-to-day gameplay a lot more interesting. Niantic is promising Rare Candies and Golden Razz Berries to help lure and power up these Legendary Pokémon, but there will also be Technical Machines added to the game. Technical Machines teach your Pokémon new attacks, which means you can improve your Pokémon by teaching them new Fast or Charged attacks with these machines. This takes the random element from evolving a Pokémon and gives you a little more control, which makes a big difference with the new Gym system.